A 3-bedroom villa that will transport you to Greece. 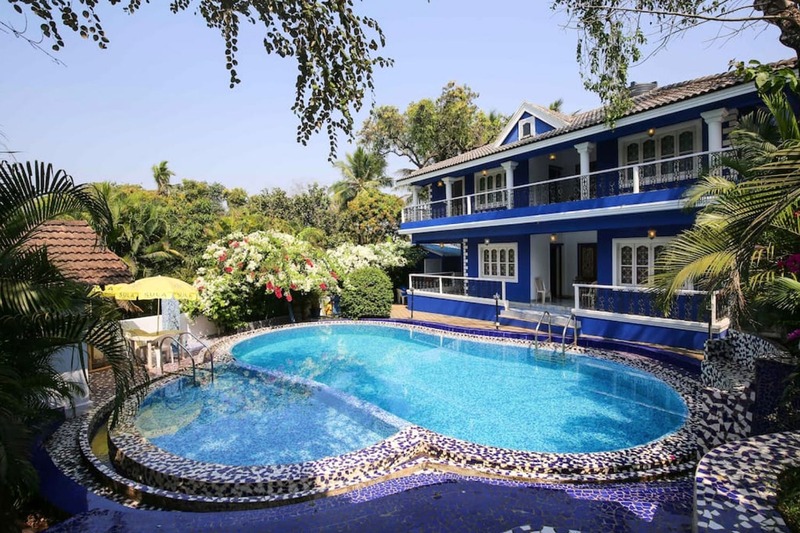 With an all-blue theme, this unnamed countryside villa in the quaint village of Siolim is calling out to you. With lush palms and coconut groves for the company, you are bound to have a relaxing time. Then, there’s always the pool to jump into or the poolside to chill at. Located in Siolim, you’ll take about an hour and fifteen minutes from Dabolim Airport and 25 minutes from Thivim station to get here. Hop onto a cab or a rickshaw to the villa. Tblue exteriors that make up for a pleasing sight with the view looking straight into their pool. Priced at INR 4,200 per night for two, this one is on the affordable spectrum of things. Also, Goa during monsoon is a different ballgame altogether. It’s greener and cheaper. If that is something you look forward to, Goa’s always game for you. The resort seems like the perfect destination to unwind with your better half if work has been taking a toll on you.